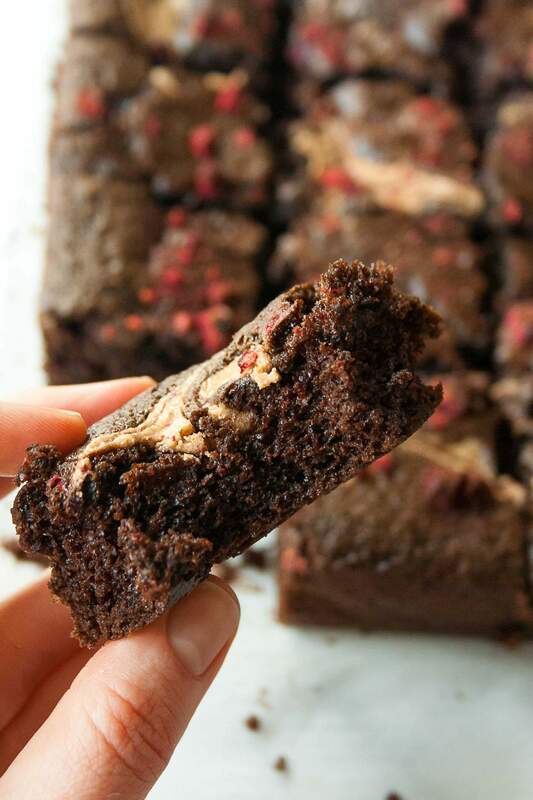 Paleo almond butter and jelly brownies are the perfect fudgy and gooey treat! Made with wholesome ingredients, these brownies are made for family celebrations (like Memorial Day!) or a mid-week dessert! Oh boy, do I have a treat for you!! IT’S A BROWNIE :))) And it’s the first brownie recipe here on Hungry by Nature! 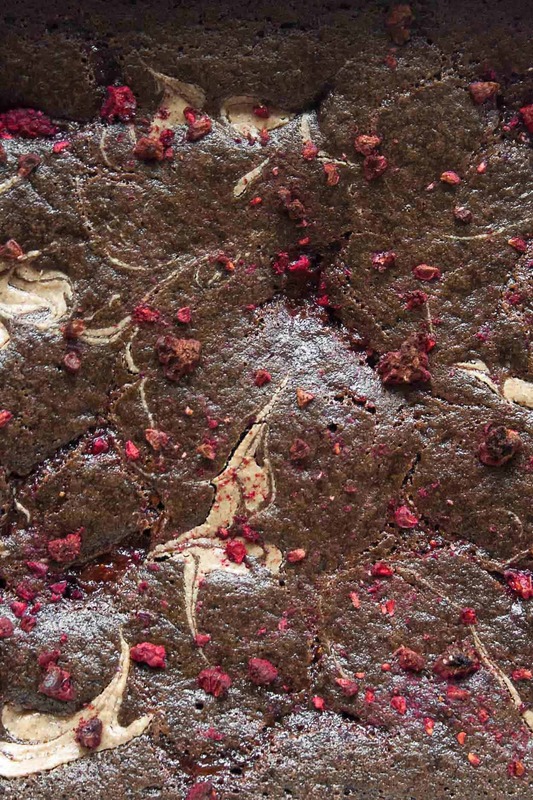 Technically, I do have one other ‘brownie‘ recipe on this site, but it’s not really a brownie recipe – more of a brownie flavored energy bite… which I’m still into, but not quite as much because these are legitimate brownies. And just in time for the holiday weekend! I am a sucker for brownies. Growing up, my mom would buy the triple pack of Ghirardelli brownie mix from Costco and we would always make them up at the cabin over the summer holidays! And because I, like most kids, ate my fair share of PB&Js – and obviously loved them – I knew I wanted to combine the two. Because what is better than peanut butter and chocolate? Or this case, almond butter and chocolate?! 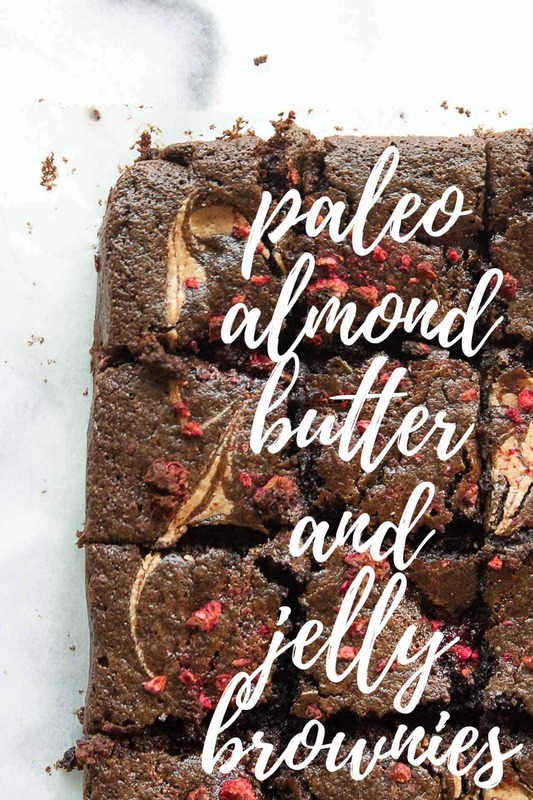 If you’ve been following me for awhile or if you follow a paleo diet, then I am sure you have all of the ingredients in your pantry to make these paleo almond butter and jelly brownies! These are a simple mix of almond flour, cacao (or cocoa) powder, baking soda, salt, coconut sugar, eggs, almond butter, maple syrup, vanilla extract, coconut oil, chocolate chips (dairy-free if you’re avoiding dairy), and almond butter, raspberry jelly/jam, and freeze-dried raspberries to top! The almond butter, raspberry jam, and freeze-dried raspberries really make these feel like a AB&J. The almond butter and jelly is swirled through the dough before it is baked. And when you bite into the brownie, you get the creaminess from the almond butter paired with the sweetness from the jelly – perfection! I know you’re going to love them. Happy Memorial Day friends – I hope you have a wonderful weekend celebrating!! 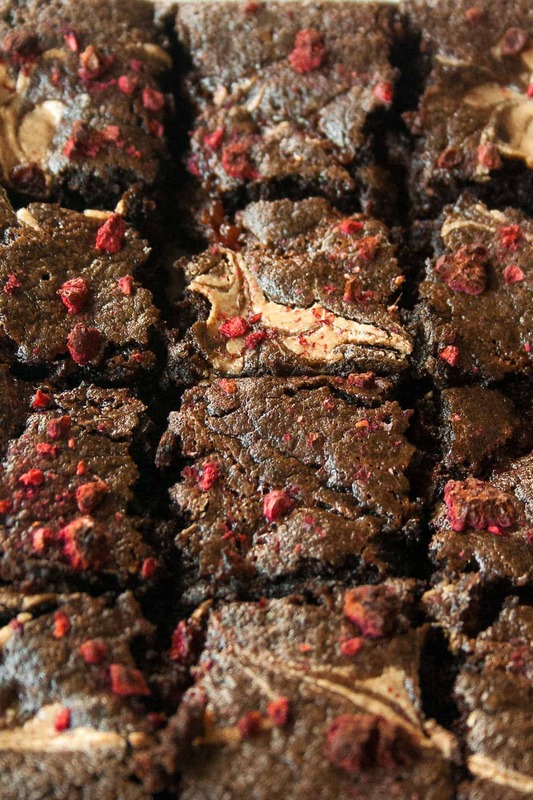 Make these Paleo Almond Butter and Jelly Brownies and show me!! Post a picture on social media and use the hashtag #imhungrybynature so I can see! Preheat oven to 350 degrees F and line a 9×9 in dish with parchment paper. Whisk together dry ingredients, including coconut sugar. Mix together wet ingredients. Add dry to wet and mix to combine. Fold in chocolate chips and pour into lined baking sheet. Place small (about 1/2 teaspoon) drops of almond butter and jelly across the top. Swirl with a toothpick and top with freeze dried raspberries. Pin this for your Memorial Day BBQ! Is it possible to substitute the eggs? I’m allergic…the worst. Hi Andrea! I have not tested this with an egg substitute; but if you want to give it a try, I would use two flax eggs instead. Here is a great tutorial: https://minimalistbaker.com/how-to-make-a-flax-egg/. If you try, please comment and let me know how it works!